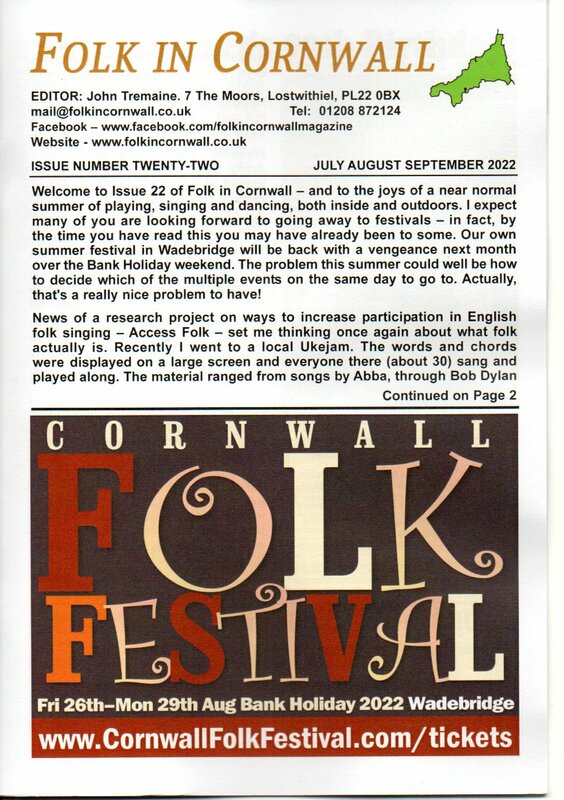 Folk in Cornwall magazine, the successor to the long running Folk News produced by Chris Ridley, has now been going for a year. We continue to aim to support the thriving folk scene in Cornwall by providing information both through publishing the printed magazine every three months, and through this website. Folk in Cornwall is run on a voluntary basis. Production and distribution costs are kept to a minimum and are met by advertisers and through donations from supporters. We also rely on club and event organisers to keep is informed of their activities. If you know of anything that is happening on the folk scene that we have not included, or if you would like to support Folk in Cornwall, please get in touch. This webiste has details of song, music and dance clubs, groups and sessions - including Google maps to help find them. There is an event diary. On the diary page there is a link to details of when regular events - weekly or monthly clubs and sessions - happen. The magazine page allows visitors to view and download pdf versions of all issues of the magazine. For this year we have added a Links page. This has details of and links to a number of other websites providing information on folk related matters both locally and nationally. If there is anything else you would like to see on the website please let us know. Editor: John Tremaine, 7 The Moors, Lostwithiel, PL22 0BX. Phone 01208 872124.